In Facets of Fortune®, you are plunged into a world of high-powered gem trading, with a relatively small amount of money to get you started. Your goal is to buy low and sell high, using special gem trading cards in strategic and surprising ways to make thrilling plays for cash. Sometimes, it seems like your fortunes have fallen so low that you’ll never get ahead, but with one clever play you could suddenly find yourself on top of the gem world! Rolled on every turn to change the fortunes of every player by making markets go up or down. A lucky roll, and you can steal anywhere from one to five gems from your opponents! The centerpiece of the gem markets, where all fortunes are either made or squandered. Used to buy, sell, trade, and heist gems. Play your cards right and you could make millions! The markers keep track of the rising, or sinking, value of gem markets. Colorful, sparkling, plastic replicas of emeralds, diamonds, rubies, and sapphires. Used to hold your colorful, sparkling, plastic replicas of emeralds, diamonds, rubies, and sapphires. Make millions at the very end by using your Stop Card to prevent a gem market from crashing! You start with only a small amount of cash, but clever plays and smart buying decisions will help you end up with a fortune big enough to win the game! 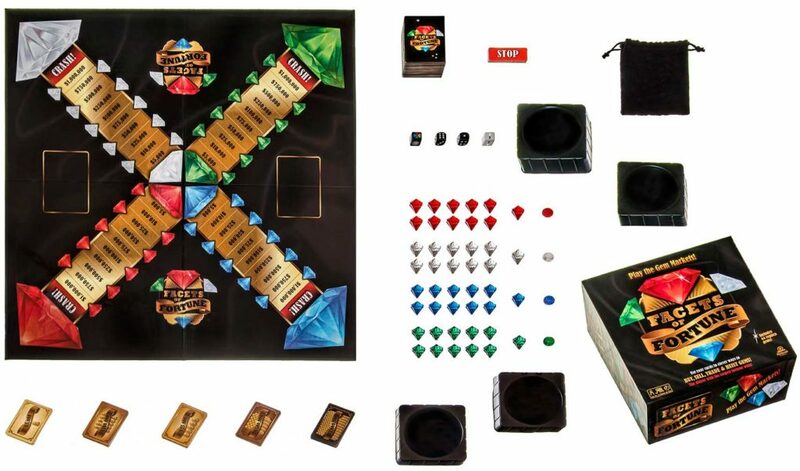 A convenient storage place for gems, dice, and value markers when the game is not in use.